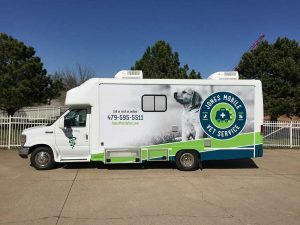 Jones Mobile Veterinary Services is proud to serve Northwest Arkansas and surrounding areas. We are dedicated to providing the highest level of veterinary medicine along with friendly, compassionate service. Seeing animals in their home allows us to treat the animals in a comfortable environment. Please let us know of any specific requests or conditions that will require special attention. We promise to communicate with you throughout the process to make sure it goes smoothly for you and your pet. If you have any questions about how we can care for your pet, please don't hesitate to call us at (479) 595-5511. Thank you!